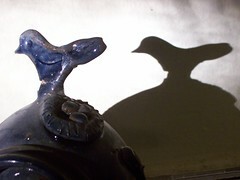 Yesterday afternoon as I was starting supper and gathering things for my weekly knit night I noticed this shadow cast by a ceramic birdhouse* on my kitchen wall. It seemed an appropriate way for me to end the year- looking back on the things (and people!) that I love and have influenced me. It has been quite a year- filled with good things in both business and my personal life. For a girl who likes boundaries, it has been interesting to watch the good things flow back and forth in ways I would not have expected. This blog has been fun- and you all have been such a support for me, both personally and professionally. Thank you. My friend Molly was responsible for thrusting me into this blog/etsy/flickr community I've come to rely on for inspiration and feedback. Thanks, dear friend. So many of you are valued friends and have really MADE this year for me. I hope that good things come to you all in this new year. I'm excited and hopeful for the future. Be safe tonight, everyone. My own New Year's Eve plans will be quiet- some sushi at home in comfortable, cozy clothes with knitting and the boys that I love (Little boy came down with a rip-roaring case of pink eye yesterday, so our more "festive" plans have transformed into comforting ones, which are 100% acceptable to me!). Happy 2009 everyone! * this birdhouse may be the first piece of pottery I ever purchased- there's one other contender for that honor. It was made by a fellow from Spain who lived in Oxford in 1999-2000. You can barely see the serpent crawling up the side towards the nest and eggs. I love it and have glued the bird back together on top of the house at least four times. It's one of my favorite pieces. Are you worried? I'm worried. Sales are slow, I had a big car repair this week, virus season is upon us, and there's the rest of the world that seems to be tanking. I am not naturally an optimist- it is so easy for me to get bogged down in the worry. I don't know about you, but I'm making a concerted effort to focus on what's good and wonderful in this life, especially right now. knitting, cooking, fall leaves beginning to color up, an upcoming camping trip, another 5k to run, intensely blue sky that only happens once summer's over, open windows, a job that is keeping me busy, a beautiful happy family, Saturday morning pee-wee soccer games, friends and customers asking hopefully after my holiday pottery plans - the list could, and should, go on. Let's all focus on what's good and possible instead of worrying about what is or might happen. I hope that you all find something wonderful this weekend to buoy your spirits. 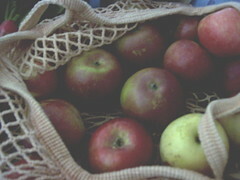 Some of these apples are going to go into a surprise galette for my boys this evening. I wish I could share it with you, too.